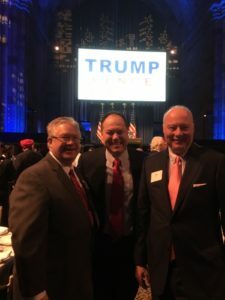 Jani-King CEO and President Jerry Crawford was one of a few select board members from the International Franchise Association to be invited by Robert Cresanti, IFA President, to an exclusive event hosted by President-Elect Trump’s transition organization called Trump for America, Inc. The purpose of the power breakfast event was to bring together prominent business leaders to network and raise funds to support the transition of the incoming administration. 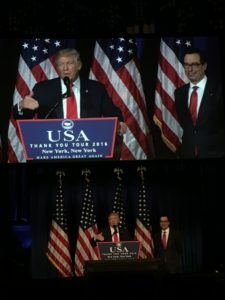 Mr. Crawford attended the high-profile event, at which President Elect Trump was the featured speaker, along with Mary Crawford and master franchise owner Jane Tapken. Jani-King’s representatives were seated at a table with Robert Cresanti, IFA President, Matthew Haller, IFA Senior Vice President of Communications and Public Affairs, Charlie Chase, President and CEO of First Service Brands, Gordon Logan, SportsClips Founder and CEO, Bill Hall, Dairy Queen Franchisee, and lobbyists from the IFA. During the breakfast event, talk of President Elect Trump’s upcoming cabinet appointments spread through the room. Attendees of the breakfast were encouraged to hear the name of one particular leader; Andy Puzder, Chief Executive of CKE Restaurants. CKE Restaurants owns Hardees’, Carl’s Jr., Green Burrito and Red Burrito restaurant brands and has a total franchise system with 3,750 franchised or company-operated restaurants in 44 states and 40 foreign countries and U.S. locations. The following day on Dec. 8, Trump’s transition team made the official announcement that Mr. Puzder was indeed his nominee for United States Secretary of Labor. Discussions at the power breakfast also centered around the nomination of Oklahoma Attorney General Scott Pruitt as the next Administrator of the Environmental Protection Agency. Later that day, President Elect Trump made that nomination official as well.